Microgaming Blackjack - Games, Rules and more! Microgaming offers more online blackjack games than any other online casino. The software is one of the most popular online casino software platforms in the world. Their software also has many variations of the same game within their software. The most common variation is to use the classic software version and a Gold Series version of the same game. The Gold Series version typically has a higher minimum bet. Another variation is single hand and multi-hand play. The multi-hand versions typically allow a player to bet up to five hands in the same deal. There are many options for players within the software. 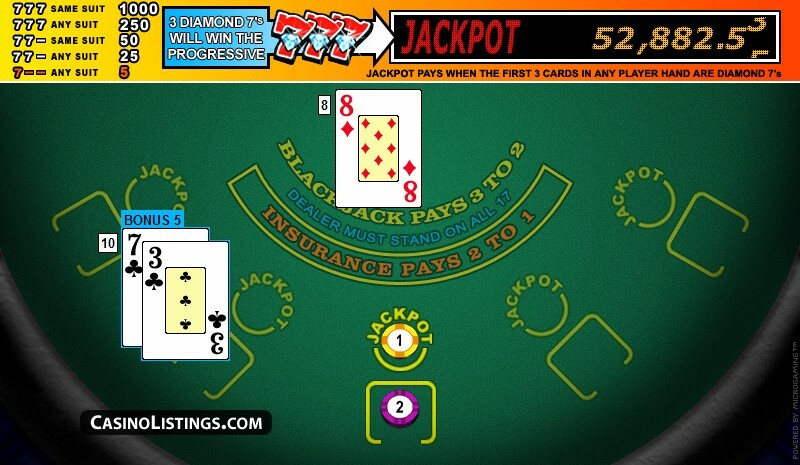 Players can choose to sit back and let the software play automatically with Microgaming’s autoplay feature. This feature involves a predetermined strategy chart. Players can edit the strategy chart to their preferences so that auto play’s actions are identical to the way that they would play if the player had control. This feature is great for clearing bonuses if blackjack is an approved bonus game. It is also nice if a player does not want to have to click for every action and just wants to watch the action. Auto play is far from the only option within Microgaming’s online blackjack software. Players can choose from four different speeds so that the action moves at the pace that they desire. There are five sound settings. These sounds are game sounds, win sounds, background sounds, advanced sounds, or all sounds off. There is also an auto rebet feature if a player wishes to bet the same amount on each hand. A quick deal feature removes animation. Players that do not want their busted hands picked up immediately can choose the “Do not remove losing hands” feature. 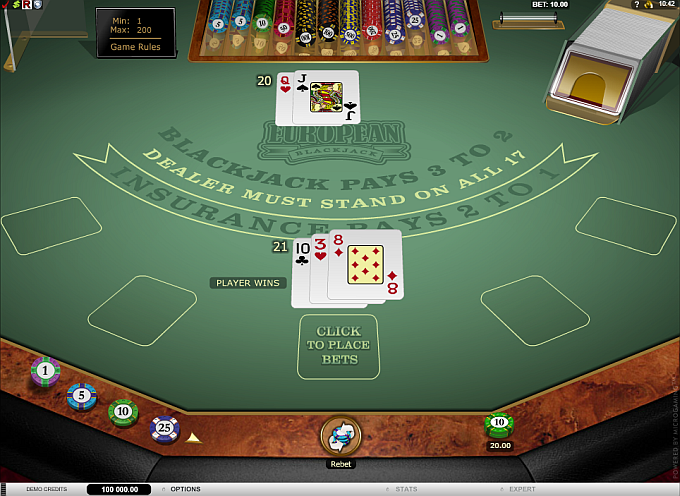 This way the player can see the hand that they had once the dealer’s action is complete. 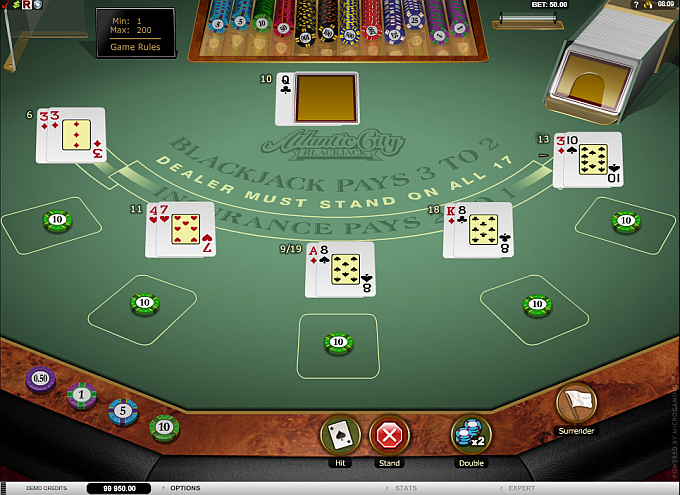 Atlantic City Blackjack is available in both the standard software version and the Gold Series software. The standard software version has a betting range of $2-$500. The Gold Series version has a $5 minimum with a $200 max bet. Atlantic City Blackjack is available in single hand and multi-hand. Multi-hand allows up to five hands. Big 5 Blackjack is a standard blackjack game. 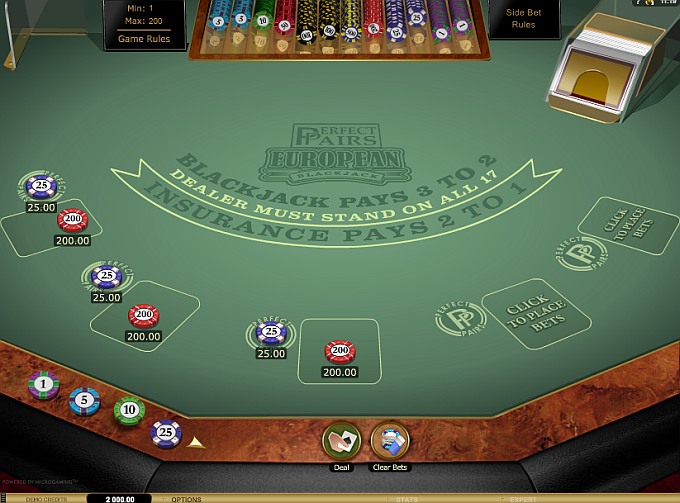 The game is dealt European style, meaning that the dealer does not deal their down card until the player has finished all of their action. Big 5 Blackjack has a couple of annoying features. The software will always ask you to surrender before asking you to do anything else. Surrender would usually be an option on the same screen as hit and stand. The game also makes players rebet in two steps. When the hand is over, the player is asked if they wish to rebet. They then have to confirm it to start the next hand. Bonus Blackjack is a standard blackjack game with an optional side bet. This side bet is based on being dealt two suited cards. An ace and a jack of spades is the best possible hand for the bonus with a payout of 50-1. The bonus side bet has a $2 minimum. The game is available in the classic software and Gold Series version. Bonus Blackjack is available in single hand and multi-hand in both classic and Gold Series. 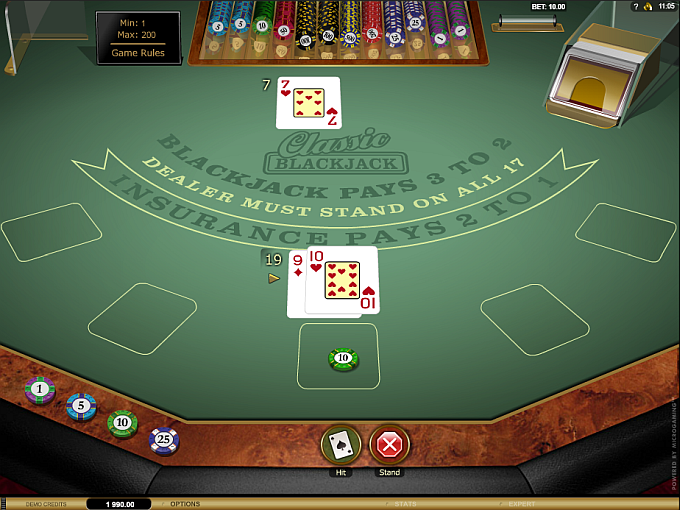 Classic Blackjack is a standard blackjack game dealt with one deck. Classic Blackjack is dealt European style. That means the dealer will not check for blackjack until the player acts because the dealer will not have their down card until the player’s action is completed. The game is available in the classic software and Gold Series. Double Exposure Blackjack is dealt with all cards face up. 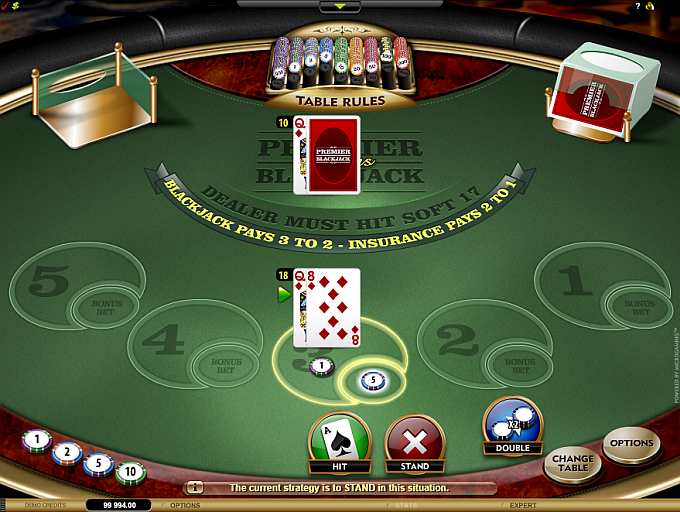 The player can see both of the dealer’s cards and bases their decision on the dealer’s hand. The dealer wins all ties except natural blackjacks where the player wins. Blackjacks pay even money. Double Exposure is available in three different versions. There is a single hand Gold Series version. There is also a multi-hand version where players may play up to five hands at one time. Multi-hand is available in both the classic software and Gold Series. European Blackjack is dealt differently from American Blackjack. The dealer only receives one card, which is dealt up. The players finish all of their action and the dealer deals their last card. If the dealer has blackjack, all bets lose. This can change some double down and split decisions. There are five versions of European Blackjack. There is a single hand and multi-hand version of the classic software and a single hand and multi-hand version of the Gold Series software. High Streak bonus uses the above European Blackjack rules but has its own exciting side bet. The betting range is $2-$200 for both the blackjack bet and the bonus bet. The bonus bet is fun but carries a high house edge. 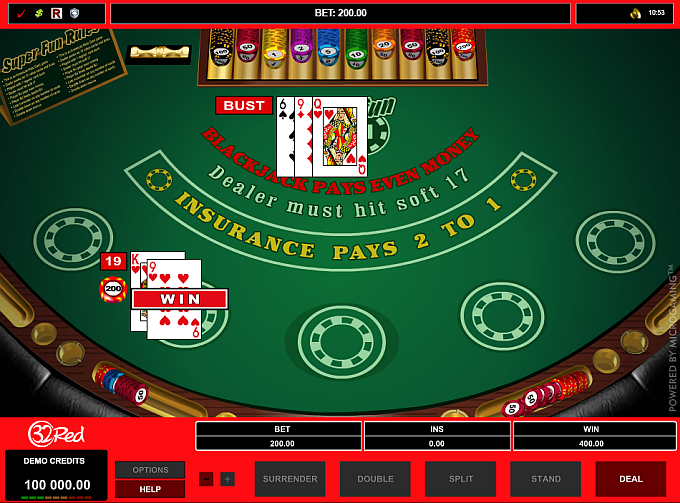 The player may place an optional side bet. To win, the player must win two hands in a row. A push will push the bonus bet and keep it alive for action. The first bet is placed next to the blackjack bet. If the player wins the hand, the bet is moved to the second winning spot. If a player wins the second hand before a loss, their bet will carry to the third streak bet. If a player wins three hands in a row, the bet moves to the fourth spot. If the player wins the fourth spot, it moves to the fifth. If a player wins five hands in a row, their bet is returned, along with their winnings. Keep in mind that pushes are no action on this side bet. A player must lose a hand to lose the side bet. A player can continue to bet the side bet as the bets moves after each win. If a player wins a hand, they can place a new bet. If they win again, the side bet that they just placed moves to the second spot, and the previous bet moves to the third spot. A total of five side bets can be up at one time assuming a player continues to win or push. The bets are individual so a player that wins five in a row will be paid for each winning spot. 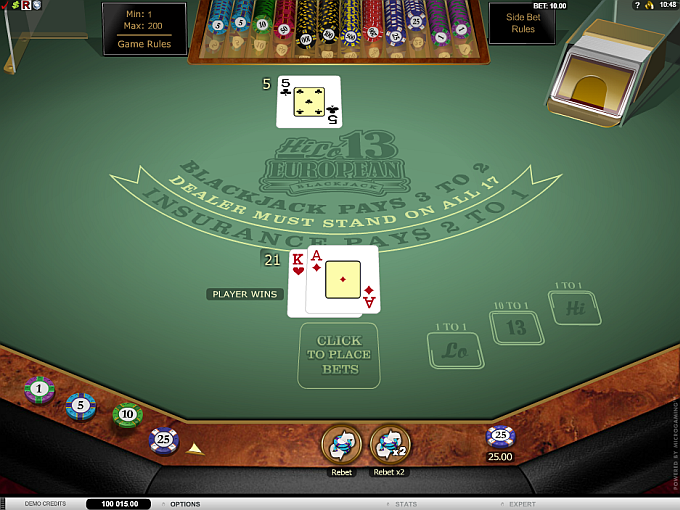 Perfect pairs is another European Blackjack variation with a side bet. The blackjack rules are the same as the standard European Blackjack rules, the only difference is the side bet. Players may bet the optional side bet in the hopes that they are dealt a pair. Triple 7’s Blackjack is another European Blackjack variation. The rules are the same as European Blackjack. The difference is the side bet which features a progressive jackpot. Receive three diamond sevens in this four deck game as your first three cards and you will win the progressive jackpot. There are also other ways to win the side bet. Pontoon is only available in the Gold Series version of the software. It is available in both single player and multi player. The goal of Pontoon is to be dealt a Pontoon, which is a natural blackjack. A Five Card Trick is the second best hand. This is a five card hand that does not bust. Both hands pay 2-1. The rules are standard Pontoon rules. 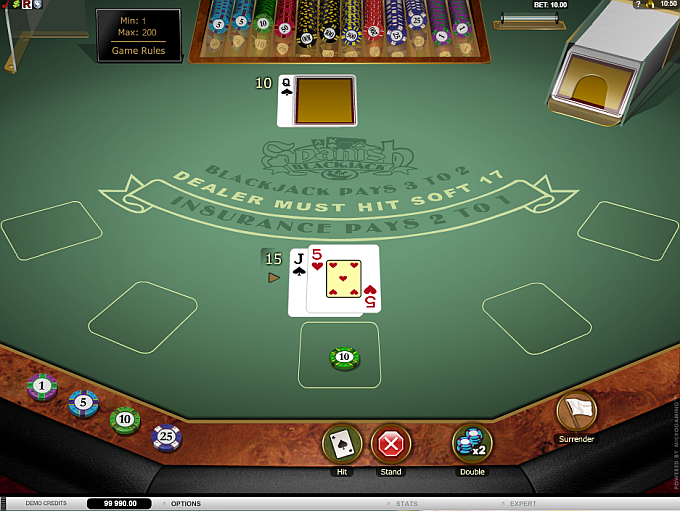 Spanish Blackjack is a blackjack variation where there are no tens in the deck. There are still jacks, queens, and kings in the deck. There are special wins on unusual hands that make up for the dealer advantage of having fewer bust cards. Bonus hands do not apply if the hand is split or doubled. 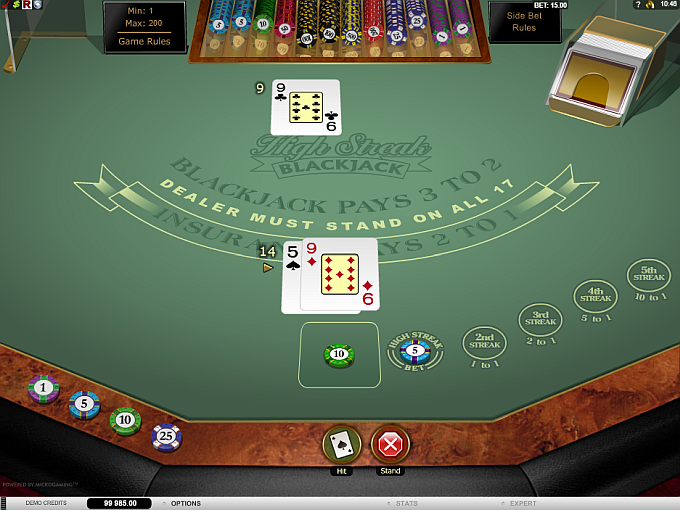 Spanish Blackjack is available in both the classic and Gold Series version. It is also available in single and multi hand. Vegas Downtown Blackjack allows up to five hands in action at one time. The game is available in the classic and Gold Series software. The game is a standard double deck game found in most Las Vegas casinos. The game is available in classic and Gold Series, and in single and multi hand. Even though this game is called Vegas Strip Blackjack, it is unlike most Vegas Strip Blackjack games. 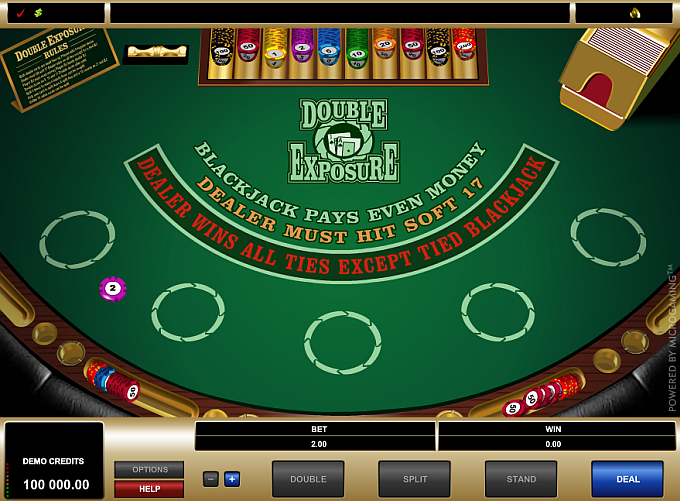 This game deals with four decks which is unusual for the Las Vegas Strip. The game also stands on all 17’s, another rarity in Las Vegas. This game is better than you will find on the Las Vegas Strip without having to deal with the crowds. 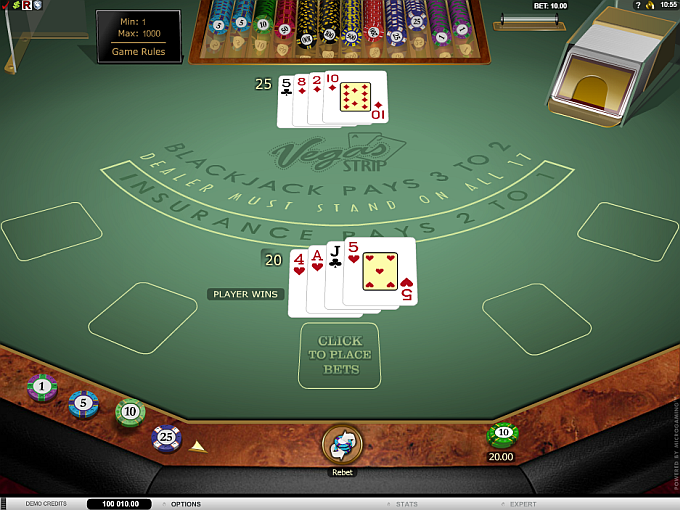 Vegas Strip Blackjack is available in single and multiplayer on both the classic and Gold Series software. Super Fun 21 is an unusual blackjack game that is a hybrid of blackjack and Spanish 21. There are many fun bets to play with Super Fun 21. In exchange for all of the fun bets, blackjack pays even money.